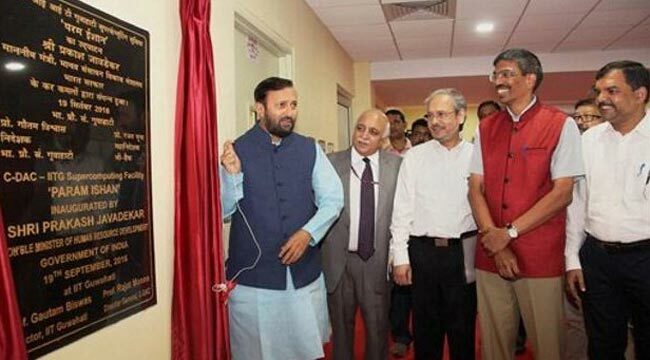 Union Human Resource Development Minister Shri Praksh Javadekar launched PARAM-ISHAN supercomputing facility at IIT, Guwahati on 19th September, 2016. “It is a one of the glad moment to have fastest and most powerful computer in northeastern, eastern and southern regions” he said after launching the PARAM-ISHAN super computer. The IITs are modern temples for development and we reiterated our commitment to give a big push to research and innovations by empowering the educational institutes to transform into higher seats of learning and platforms for advanced research. A nations’ potential for growth today, is evaluated on the quality of its research and development. He also expressed that, C-DAC and IIT Guwahati is a strategic move that will provide a boost to both the HPC users and the community through the deployed PARAM-ISHAN and several technology areas will be positively affected through the introduction of the new Supercomputer. Prof. Gautam Biswas, Director, IIT Guwahati said that PARAM-ISHAN have power of 250 Teraflops and three hundred tera bites capacity and this will not only augment the research initiatives in the Institute, but also help in creating an ecosystem for attracting right talents to the field of research. He also opinioned that, happy to have partnership with C-DAC on this initiative, they have proved themselves in the field and we look forward to collaborate further on new and emerging areas of science. PARAM-ISHAN can be used in the application areas like Computational Chemistry, Computational Fluid Dynamics, Computational Electromagnetic, Civil Engineering Structures, Nana-block Self Assemble, Optimization etc. North East India receives heavy rainfall during monsoon, which leads to flooding and landslides. PARAM-ISHAN can be used for Weather, climate modeling and seismic data processing.